This morning I routed the edges of 80 inlaid boxes for a corporate gift order. Finish sanding, signing and application of Danish oil finish remains before early December delivery to my customer. Eighty boxes is a large order for me to work into my teaching schedule. But I began milling parts in September. This is election day. I've never seen our nation so purposely divided. Our bright beacon on the hill is dim. 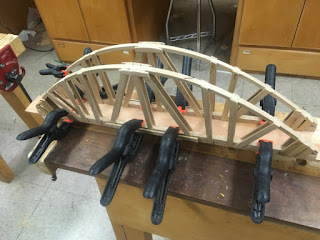 Yesterday in the Clear Spring School wood shop, my 5th and 6th grade students neared completion of their arched bridges. May this serve as a sign this election day. We need to build bridges in our society. Those who work to create fear and distrust should be brushed aside so that we connect with each other and build a better and more just society.